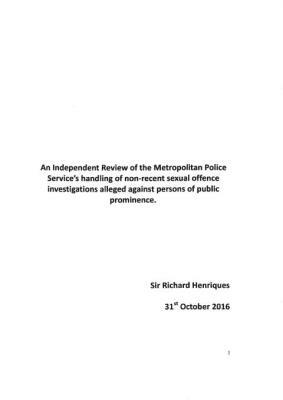 ​Sir Richard Henriques independent Review of the Metropolitan Police Service's handling of non-recent sexual offences identified no fewer than 43 separate blunders and said it was time for police to stop automatically believing the accounts of alleged victims. The actions of the Metropolitan Police is not unique to the Met - their actions are repeated across police forces in England. The 'Henriques Report' put forward sensible and pragmatic recommendations which rebalance the pendulum in investigations of historical sexual assault. The UNFOUNDED ALLIANCE is driven to get Henriques recommendations implemented by Government. In future, the public should be told that 'if you make a complaint we will treat it very seriously and investigate it thoroughly without fear or favour'. Every effort should be made to minimise leaks of information by examining current systems and increasing sanctions. In non-recent cases particular consideration should be given to the necessity to arrest or re-arrest in accord with Code G and the guidance therein. At the commencement of an investigation a time limit should be fixed. When announcing publicly that no further action will be taken, rather than stating insufficiency of evidence, an alternative is that 'the case failed to meet the evidential test'. When announcing publicly that no further action will be taken, no details of the allegations not already published should be disclosed.